For anyone who loves spring in Appalachia there is nothing more defining in the spring then the smelly Ramp. A wild onion that many of us in the hills love and look forward too every year. 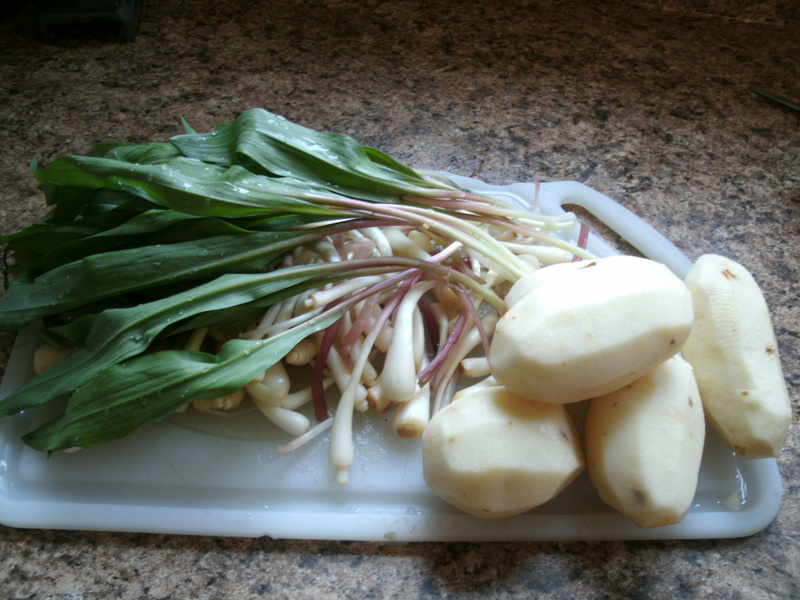 The traditional way to cook a Ramp is to chop up the greens and all, frying it in bacon grease until soft and serve it with the traditional brown beans( pinto usually) corn bread and fried potatoes. I love this just like any hillbilly, but on occasion, I like to use ramps more like garlic and bring out more of their subtle flavor. I came up with this recipe last spring after we had a large amount of ham left over after Easter. Ramps are at the peak of their short month-long season during this time of the year and we loved this to use up left overs. I have other posts about Ramps if you want more recipe ideas. 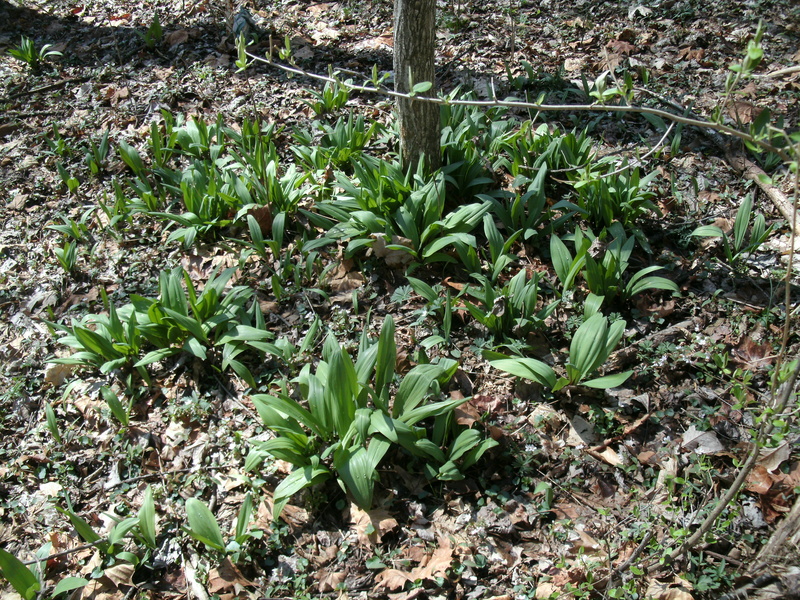 These are ramps that we forage for and then clean and freeze every spring for summer and fall use. 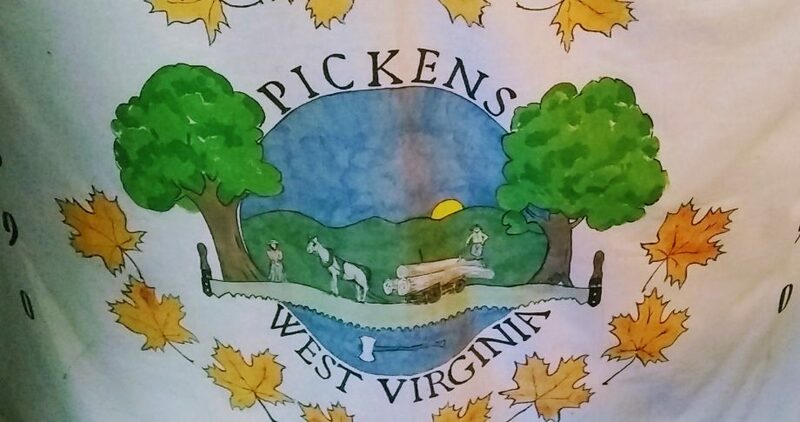 Sadly, they never make it to winter because our family likes to eat them to much. 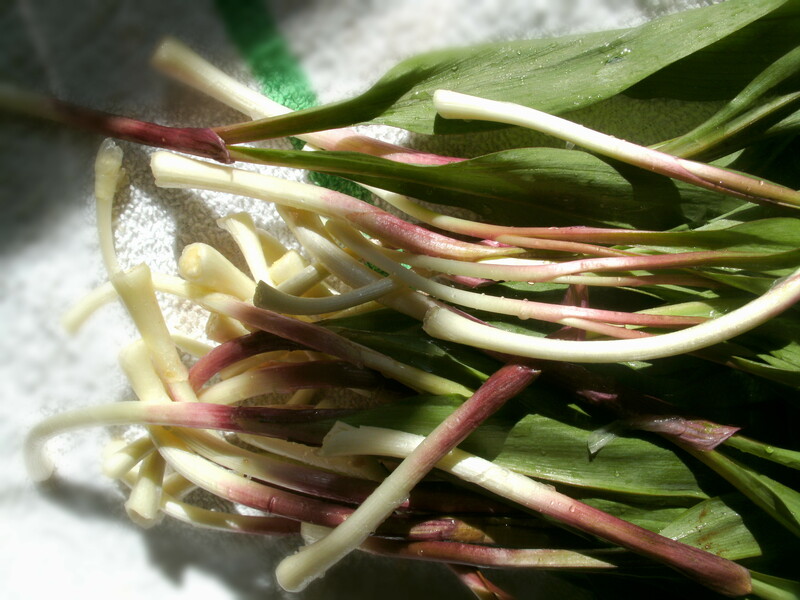 So here is another way to eat a small bunch of ramps without using all the greens. A great way to use up wilted ones or some with out the green stems. This very simple soup is ready in about 30 minutes and produces about 6 servings.. I started with 5 med white potatoes peeled and diced into medium-sized chucks and about 1 cup ramp bulbs and about 6 ramps with tops and about 1 1/2 cups diced ham. Make sure that the ramps get well washed to remove any hidden dirt and chop them fine. They are hard like garlic so mince well to make sure they soften quickly. melt 1/2 stick butter in the bottom of a 5 or 6 quart stock pot add minced ramps with tops and garlic and season with about a table-spoon salt and a dash of pepper. Saute until soft and aromatic about 5 minutes. Add 4 cups water, 3 bouillon cubes and chunks of potato simmer with Bay leaf about 20 minutes. Until the crisp edges of the potatoes begin to soften into the stock. Then add parsley and celery flakes and about 1 to 2 cups diced smoked ham. The soup appears to have a light green cast to it at this point. Simmer again for about five minutes and then add 1 can condensed milk and about 3/4 cup potato flakes (you can substitute cream here, I usually always have canned milk on hand so I use it). This will thicken the soup and make it creamy without losing all the texture of the potato chucks in the soup. Make sure the potatoes are soft all the way through at this point, try to stab a chuck with a fork. The potatoes should fall apart or smash when stabbed, if not, continue to simmer for several more minutes. Remove the bay leaf and allow to cool and thicken. I wait about 8 to 10 minutes to thicken the soup.If it still seems to thin, add a few more tablespoons of instant potatoes and add more pepper if needed. 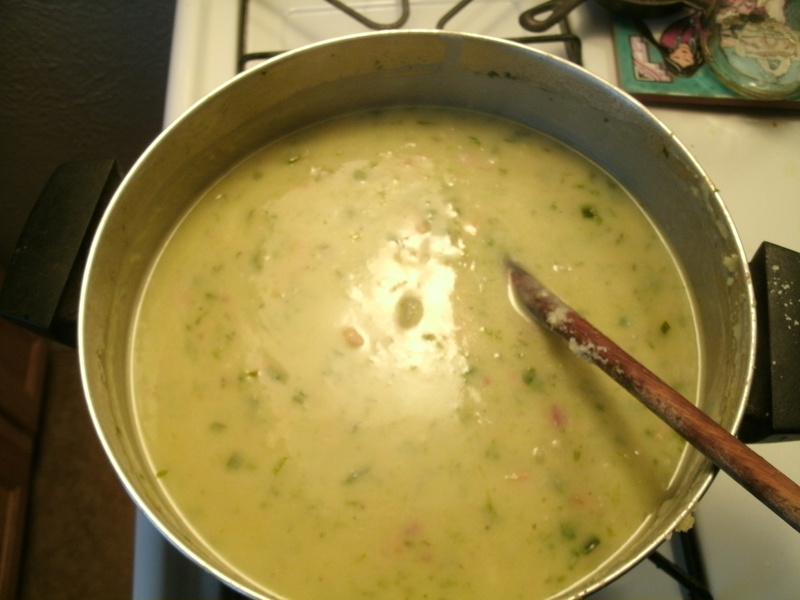 Once you add the milk the color appears more of a light tan with the green floating in the soup. 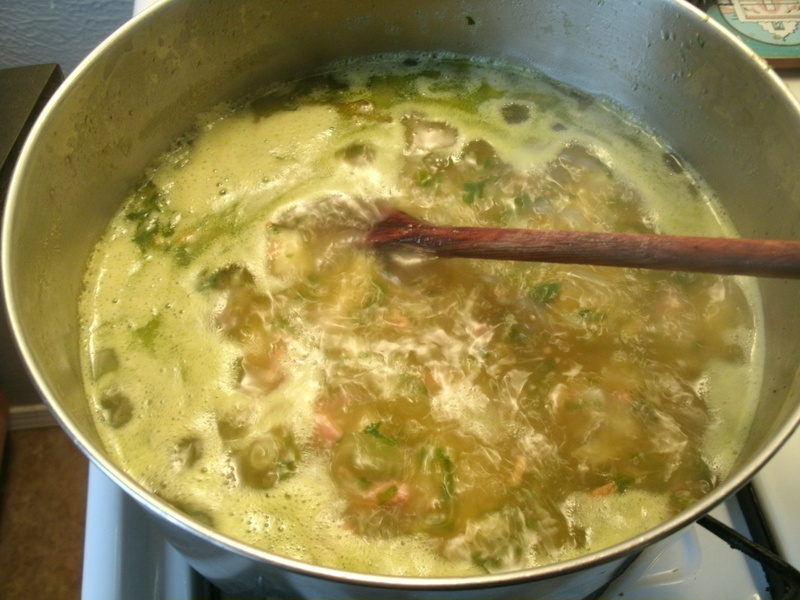 Beware, if you add to many greens to the soup it will turn a wonderful grass-green color. I made a batch this way and a couple of my friends felt put off by green soup, so you may want to limit that amount of greens you add. 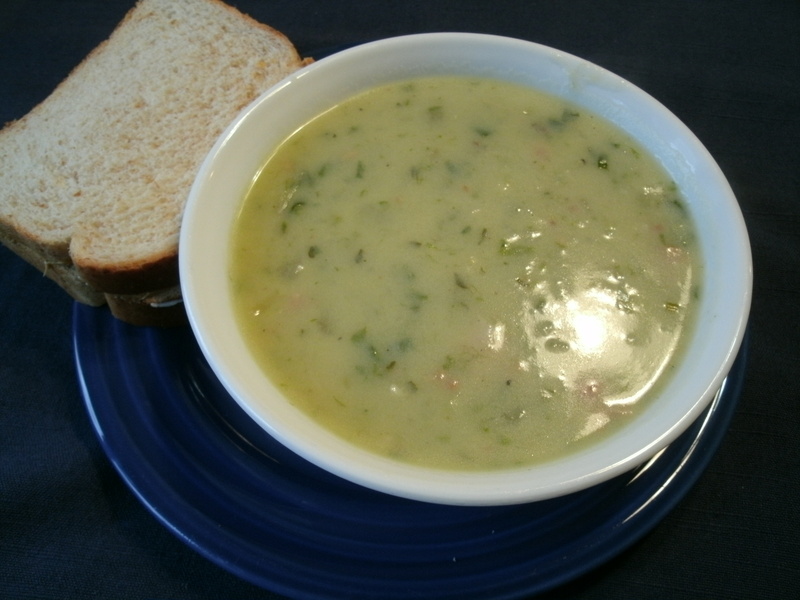 This soup also brings out he aroma of the ramps so if you are not completely used to the smell of roasting garlic or of fresh ramps you may not find the aroma of this soup appealing. Our family on the other hand looks forward to the smelly little guys and knows that with that scent comes a wonderful taste of spring. I hope you enjoy and eat more Ramps.